When pairing the logo in a lockup always use Zilla SemiBold placed flush left above the wordmark. This is the recomended and primary setting for most products, projects, initiatives, partnerships, open standards, teams, internal products, communities, and events. The recommended arrangement places our logo below the text in such a way that the brand can fully support the relationship as a platform. In certain rare instances your logo lockup will have to be arranged with an icon. If your design assets include associated iconography we stillencourage the use of the Primary logo lockup while using the icon elsewhere on the page. 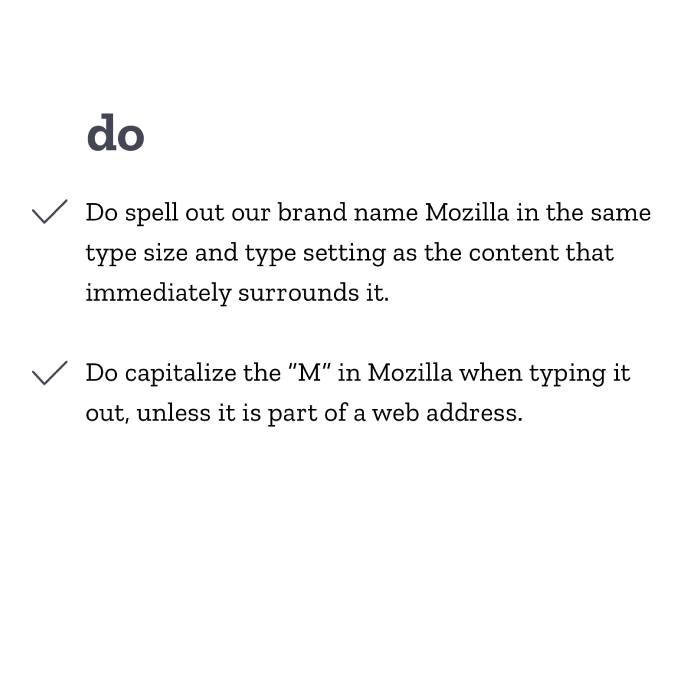 If it is not possible to use the icon elswere as part of your layout then the icon can be added directly to the left of the top line of text. Please follow the sizing specifications to the right. In very rare cases your logo lockup will require a second level of text beneath the main text. The secondary text should be set in Zilla Slab Regular and sized to 3/5 the height of the logo. This is the only use case where the logo will sit stop the supporting text and therefore it is not recommended unless absolutely necessary. Please follow all size and spacing specifications and do not add any additional elements to this arrangement, or use this lockup without a secondary level of typograpahy. Our logo lockups never include qualifying language, like supported by, by, from, or in partnership with. 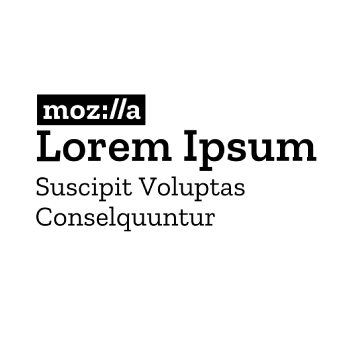 The logo placement below the name shows that Mozilla is supporting the project. Qualifying language for all projects should be used only in copy, when the name of the project is written out, not in the naming lockup. 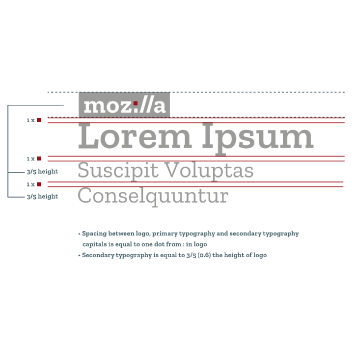 Place our brand name first in copy for a product, tool, service, project, or resource created by Mozilla. This ordering shows the strongest association with the Mozilla brand. In cases where a product, application, or service needs more independence than provided by previous options use this arrangement. Project names precede our brand name, along with other tools, services, resources, or assets created by Mozilla. This presentation can be used for partnerships such as grants we are making with teams or partners who create the majority of the work. Used for media or editorial collaborations in situations where Mozilla has partnered with another organization, team, or agency and want to credit their contribution. A product, tool, service, resource, or other asset created by Mozilla with contributions from other partners. Mozilla is not the sole creator or owner of these products and remains a parter in their evolution and development. 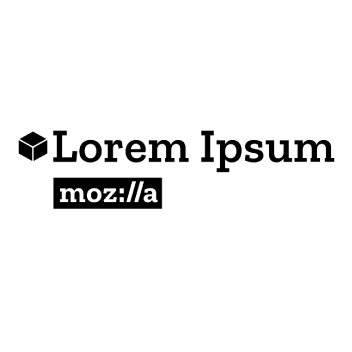 A product, tool, service, resource, or other asset from Mozilla where we are trying to establish a specific relationship with the Mozilla brand. An example might be a piece of technology we are hoping to help evolve into an open standard. 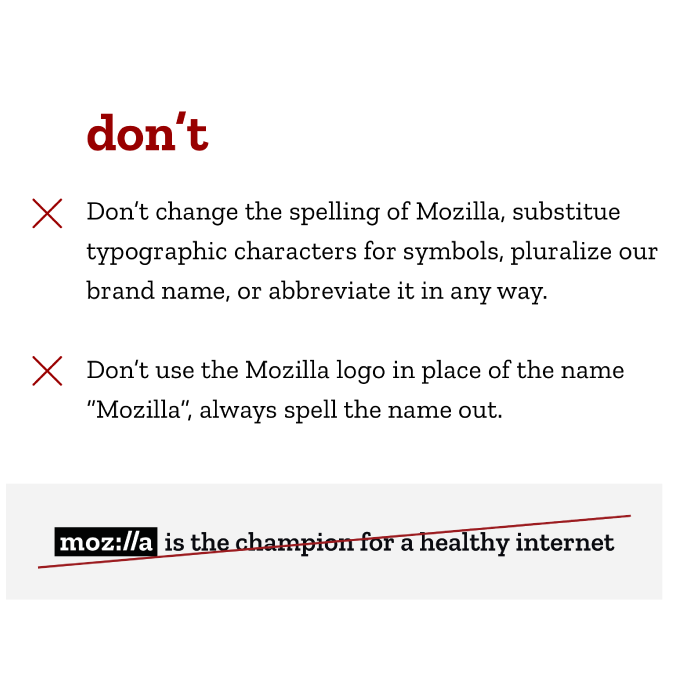 This arrangement is reserved for partnerships where Mozilla participates in the creation of content, especially where the partner has a great deal of editorial input or control.